The West Chambers County Chamber of Commerce held their Denim, Diamonds and Divas fundraiser event last Thursday, and from all accounts, things went off without a hitch. Approximately 300 local ladies showed up for the event, held at the Royal Purple Raceway Ranch at 2525 FM 565 South in West Chambers County. Featured were massages, makeovers, shopping at booths set up by nearly 100 local vendors and featuring unique jewelry, shoes, home decor items and clothing, and much more. The chamber holds annual events such as this one to provide area women with an opportunity to network and enjoy a night together. And, as usual, there was plenty of dressing for the occasion, with glitz, glamour and diamonds meshing together with denim. Its always fun to see what people will be wearing, Malechek said. For more information on the West Chambers County Chamber of Commerce, call 281-576-5440. CROSBY  Authorities are responding to drought conditions by issuing additional general warnings for residents concerning outdoor burning and water usage. Seven grass and wood fires in seven days in Crosby with the worst fire last Saturday just off F.M. 1942 near Holy Rd. beginning at about 4:30 p.m. and lasting much of the evening indicates that it does not take much to set ablaze volatile vegetation. According to Jimmy Berryman, the Fire Marshal for Crosby Volunteer Fire Dept. that fire began from the simple act of backing a car into some high underbrush and from humble beginnings with a little wind it grew to encompass wider acreage and spread rapidly even after seemingly contained. Access was the prime problem with this fire, it being on private property with limited access for trucks to get at the blaze. The new problem for firefighters seems to be that some have not gotten the idea that the Extended Burn Ban is serious. It is, and according to Berryman, over $500 in fines for simple burning from the Fire Marshals office and Harris County Sheriffs Deputies and if the fire spreads to your neighbors house, that could be charged as felony arson. The Texas Forestry Service says Wildfire activity is on the rise as the state continues to experience critical drought conditions. So far this year, Texas Forest Service crews in the northeast part of the state have responded to 631 fires that have burned 9,705 acres. Throughout the entire 2010 calendar year, 358 fires occurred in the same region, burning 4,598 acres. Extra caution is advised when using heat-producing equipment, especially in areas with tall grass. Welders are cautioned to use a spotter and have a fire extinguisher nearby. Although burn bans are in place in every county in Northeast Texas, the number of wildfires resulting from outdoor burning has increased recently. In addition to criminal charges, those responsible for escaped fires also are subject to civil liability. Current conditions are so dry that a single spark can create a dangerous wildfire. Anyone seeing suspicious activity or arson is asked to call 1-800-364-3740. The plight of the rancher and horse industry is getting worse with no grass available and the price of hay doubling and tripling.  Outside watering is allowed only from 10 p.m. until 5:00 a.m. A hand held water hose is allowed between 7:00 p.m. and Midnight and Midnight until 10:00 a.m.
 Using water to wash vehicles from 7:00 p.m. until 10:00 a.m. is prohibited except for vehicles such as garbage trucks and trucks transporting food.  Filling or refilling wading pools, swimming pools or jacuzzis is prohibited except midnight to 10:00 a.m.
 Operating any ornamental fountain or pond for aesthetic or scenic purposes is prohibited except where necessary to support aquatic life or have a recirculation system.  Wash down of sidewalks, walkways, driveways, parking lots and hard surface areas is prohibited.  Washing buildings or structures is prohibited except for fire protection.  Using water for dust control is prohibited.  Flushing gutters or any accumulating of water in streets or gutters is prohibited.  Failing to repair a leak within 72 hours after having been given notice directing the repair is prohibited. Its hot and dry in Texas Yall. Your day starts at 6 AM with a dog retching beside your bed. The noise rouses you from dreaming, and you stumble out of the room, urging the dog to follow you to the kitchen and its tiled floor. Unfortunately, he doesnt quite make it. Still half-asleep, you clean up the carpet and then fall back into bed. The dog lies down next to you, wide-eyed and sad, as if he cant believe his stomach has betrayed him. An hour later, the alarm goes off, and its much too soon. But what can you do? Its time for breakfast, emails, and work. Not long after that, its time for lunch, errands, and work. And a little later, its time for dinner and chores, and maybe some more work. The day rolls on, no relief, layering its stresses upon you one tick of the clock at a time. Minutes pass. Then something moves in the corner of your vision. A paw. You turn to see your dog tucked into the opposite corner of the sofa, a furry ball of sleep. You watch him. His little belly rises and falls with each slow, soothing breath. His nose twitches. His ears are askew. His eyes have disappeared into the black spots that surround them. His tail is wrapped around him like punctuation mark, and his head is nestled between his front legs. Peace settles over you like a warm blanket. You feel grateful for this one tiny moment, this perfect picture of serenity. You realize that life is a two-sided coin: everything is balanced. Suddenly you dont feel so stressed. When you get up, the dog follows. He stands in your closet while you change into pajamas. He sits at your feet while you brush your teeth. He looks at you hopefully when you open the fridge for a glass of water. He jumps onto the sheets when you turn off the lights and slip into bed. At 11 PM your day ends with a dog resting his head on your leg. You both sleep soundly. Members of the Highlands Chamber of Commerce heard the Harris Countys top administrator, County Judge Ed Emmett speak at last weeks luncheon on issues of importance to local residents. Emmett started by asking how many in the audience remembered when he was the state representative in the Texas Legislature representing Highlands. The year was 1978 when he was elected, but no one in the audience seemed to go back that far. This led to a discussion of how things had changed in 33 years, and what issues need attention, what to look for in the future, and what needed reform. Emmetts talk focused on his leadership of the Harris County Office of Emergency Management, issues of transportation, the business climate in Harris County with an increased population, the need for health care reform, fiscal responsibilities with the county budget, and finally, what to do with the Astrodome. As OEM head, Emmett has had to coordinate the response to several hurricanes and evacuations in the last few years, and he admitted that the county could learn from their mistakes. Harris County now has 4 million residents, with each county commissioner responsible to about 1 million. He contrasted this to Loving County, Texas which has a population of 82. With 15,000 employees, the county functions as one of the largest government bodies in the nation. He suggested an efficiency study could improve it. With so many people, transportation infrastructure is a major issue. Ships in the port are getting larger, he noted, and support systems to move cargo away from the port to the consumer must also grow. A problem here is that the TxDot budget by 2014 will be totally used for maintenance, not new roads and rail. Health care needs to be regional, in one sense, and local with neighborhood clinics offering preventative medicine. Both of these approaches would be more efficient, he said, and stretch the healthcare dollar. On the county budget process, he said it could be more transparent, and should be based on zero based budgeting not simply reducing current expenses and programs. Each expenditure should be justified before it is approved. Finally, he led the discussion to the fate of the Astrodome. A show of hands in the audience indicated almost everyone was in favor of saving the iconic building, but Emmett said the problem is what to use it for, and how to pay for the improvements that are required. One use often mentioned is a Casino, but at present this is not legal or feasible. His idea for a use, is a Festival Venue for all our fairs and celebrations. This would be weather friendly. He said there are at least 80 of these every year that could be suitably housed in the Dome. However, studies show it would cost $300 to bring the building back to a usable state. Even so, tearing it down would cost $90 million. With no money in the budget for this, he said it would take a voter approved bond issue to revive the Dome. A study is currently being undertaken, and Emmett thinks a final decision will be made by the commissioners by the end of this year. The West Chambers County Chamber of Commerce heard from David Gornet, Executive Director of the Grand Parkway association, Tuesday afternoon at Eagle Pointe during their monthly meeting. And, according to his report, things are moving at a steady clip. Gornet is responsible for promoting the benefit of the highway to area citizens, and working with local governments to secure right of way and funding for the project. He also makes regular stops at civic functions to inform local residents about the progress on the 184-mile roadway, which will encircle the entire Houston area at completion. Gornet said that studies are complete on 85 miles of the project, specifically sections D, E, F-1, F-2, and G, which pass through the Katy, Fairfield, Cypress and Spring areas, as well as I-2, which travels through the east side of the Beach City area. 28 miles of the project are open currently, and Harris, Montgomery, and Chambers Counties have given the project over to the Texas Department of Transportation (TxDOT), Gornet said. 92 miles of the project, including segments B and C, which traverse the southern portion of the Missouri City and Sugarland areas, and segments H and I-1, which will pass through the Dayton and Mont Belvieu areas. Gornet said that in addition to bond hearings, there are numerous ways of paying for the toll road, but none come without risk. If we bring a private partner into an agreement, they bring money to the table to help build the roadway, and we would pay them the tolls for a set number of years, Gornet said. In that situation, if tolls are low, then tax money makes up the difference. A public meeting was held Tuesday night at the Barbers HIll High School, with another scheduled for 7 p.m. tonight at the New Caney Sixth Grade Campus to discuss the environmental impact of segments H and I-1, as well as potential alternate routes. For more information, see www.grandpky.com. The horses are being rounded up, Elvis is ready to dance, the Houston Livestock Show and Rodeo clowns are puling out the greasepaint and the Goose Creek Cookers will be firing up the grill for the tenth anniversary celebration of the Baytown Special Rodeo. Saturday, Sept. 10 from 10 a.m.-2 p.m., this event for special needs youngsters will be kicking up the dust at Eastside Honda, located at 12527 IH-10 East in Mont Belvieu. This day of horseback riding courtesy of the Rocking Horse Riders riding club, games, barrel train rides, chocolate fountains, snow cones, a petting zoo of fuzzy farm animals and a chance to groove with Elvis himself, is ready to rock and roll. A chuck wagon lunch will be served midday. Pat Robberson, who chairs Special Rodeo registrations, reports that more than 100 special needs children have already signed up. This event is free, and Roberson is urging participants to register by Sept. 1 in order to guarantee they will receive a Special Rodeo T-shirt. Each special needs youngster will also be given a cowboy hat, a badge and a handmade stick horse being produced for the event by members of BSRA. Registration can be found on the organizations Web site, www.specialrodeo.com. Volunteers can also register at this Web site. 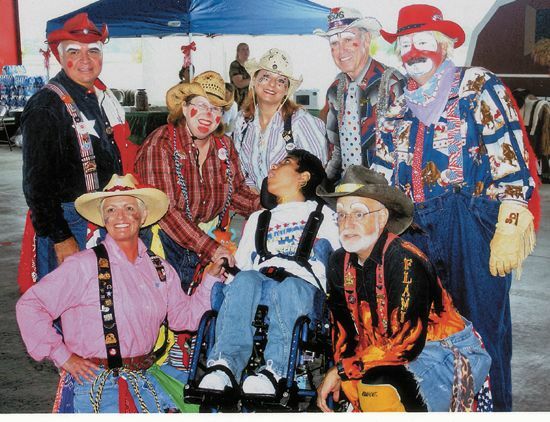 On Rodeo Day, each special needs child will be assigned a volunteer Rodeo Buddy, who will ensure the participant gets to take part in all the activities. Parents will be given the opportunity to share a day of fun with their other children. Throughout this decade Special Rodeo has drawn support for all areas of the community, and this year will be no exception, Miller said. Each year, individuals and organizations, sponsor games, face-painting, photo booths, even clean-up crews and other helpers donate their time and money to make the event a success, and that effort is greatly appreciated. NORTHEAST HARRIS COUNTY The worst drought in Texas history calls with it some implications for good citizens to cooperate with local water districts asking not to water lawns and use as little water as needed for now. 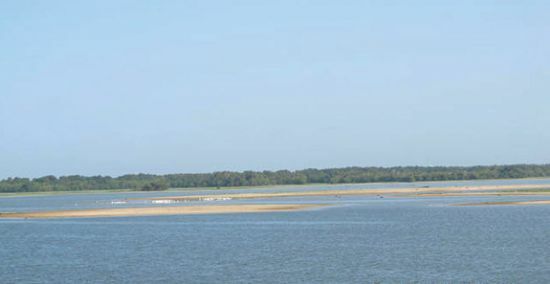 The impact on Lake Houston is evident to anyone crossing the lake on FM 1960. Texas is now in the midst of its most severe one-year drought on record, according to John Nielsen-Gammon, the Texas State Climatologist and professor of atmospheric sciences at Texas A&M University. The lake measured down 7 feet that day. There is not enough water to recreate in anymore. Its getting more and more dangerous and if you dont hurt yourself, youre going to do some damage to your boat. stated Harding, looking at old railroad pilings emerging from the middle of the lake. The last time Houston called for such a release was back in 1988 and such a decision is still about four weeks away, according to officials. They say the lake is down 6.2 feet. Crosby remains under moderate conservation warning. Crosbys surface water comes from Lake Houston but about 92% of City of Houstons water comes from the Trinity River and Highlands purchases its water from the City of Baytown that takes its water from the Trinity River. Nielsen-Gammon reports that July 2011 was the warmest month ever recorded statewide for Texas, with data going back to 1895. Average temperature of 87.2 degrees broke the previous record of 86.5 degrees set in 1998. The June average temperature of 85.2 was a record for that month and now ranks fifth warmest overall. Rainfall totals were also unusually light across the state. The July monthly total of 0.72 inches ranks third driest, surpassed by the 0.69 inches recorded in both 1980 and 2000. This is the fifth consecutive month in which precipitation totals were among the 10 driest recorded. 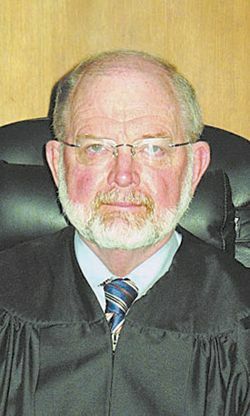 A fixture in the Chambers County legal system plans to tap his gavel for the last time, as 344th District Court Judge Carroll Wilborn, 65, has announced he will not seek re-election to his bench. Wilborn made his announcement during a Commissioners Court meeting on July 26. 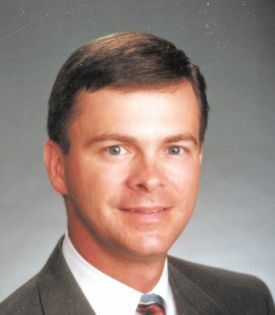 Throughout the years, Wilborn has held numerous posts within Chambers County. 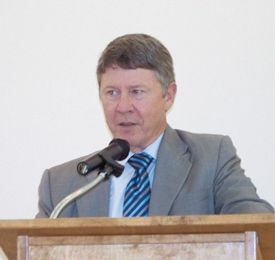 Originating as an assistant county attorney, he was also the assistant district attorney before becoming the county’s district attorney, an office he held from 1977 to 1983. He has held his current position from then until now. Wilborn also served more than 12 years on the Texas Department of Criminal Justice’s Judicial Advisory Council, as the Governor’s chairman on the state’s Criminal Procedure Revision Committee and as chairman of the Criminal Law section of the Texas State Bar. Wilborn will serve until the end of 2010, which is the end of his seventh four-year term. For more information on Judge Wilborn and the 344th District Court, visit www.co.chambers.tx.us. 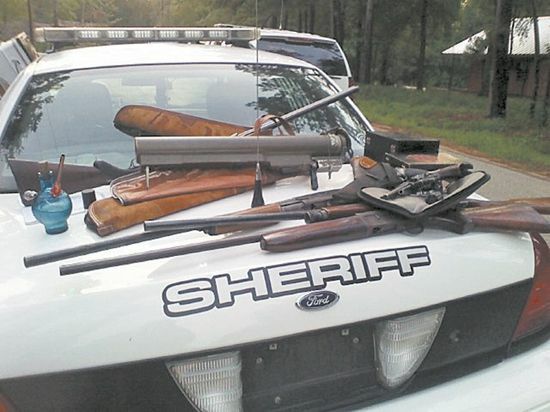 Deputies from the Liberty County Sheriff’s office discovered a huge cache of illegal items while acting on a Crimestoppers tip last Wednesday. According to reports, late at night on July 27, the deputies headed to a location on County Road 389 near the Pebble Creek area of Liberty County. The officers intended to respond to reports of suspected drug deals, fighting and loud noises from the area, with individuals coming to and leaving the area at all hours. When the deputies arrived, they discovered evidence of drug trafficking, including an undisclosed amount of methamphetamine, a marijuana growing operation, narcotics paraphernalia and currency. Located also were a number of possibly stolen items, such as four-wheelers, motor vehicle parts and electronic devices. The officers also found a stash of firearms, which included shotguns, semi-automatic shotguns, rifles, handguns, and a rocket launcher. Authorities believe that this location was a place where criminals would trade and sell items for drugs and other items. A well-known former Highlands citizen passed away recently, leaving behind a legacy of service and a love for music. Albert Pyle was born Sept. 21, 1921 in Kansas City, Missouri and passed away July 25 in Georgetown, Texas, but spent many of the years in between as a Highlands resident. Pyle was a drummer with a love for Dixieland Jazz music, and played for much of his life, until age 85. Pyle was an active member of the Masonic Order for more than 65 years, including membership in the Scottish Rite. Pyle was also a longtime Shriner, serving as the leader of the Shrine Band. 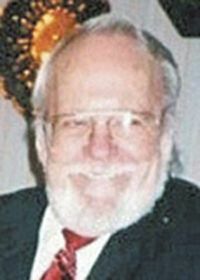 Pyle was also known for his dedication to the community, and was a president of the Highlands Chamber of Commerce. Pyle was preceded in death by two siblings, Bill Pyle and Elvie Williams. He is survived by his spouse, Lou Ellen Pyle, as well as his children, Dixie Tolbert, Cheryl Ivy, and Roxy Mize. He leaves behind also eight grand-children and 10 great-grandchildren. A funeral for Pyle was held on Saturday, July 30, at Forest Park Lawndale Funeral Home in Houston.